Warranty upgrade for 1 year Depot base warranty models.Lenovo Warranty Services provide extended service terms to match your depreciation schedule or planned refresh cycle and upgrades to onsite support and, in some cases, same day support.With Lenovo Warranty Services, you can upgrade or extend the service included with your hardware's original warranty. 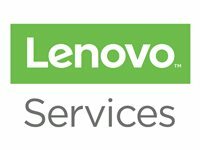 You can select to call and get support from your local Lenovo Authorized Service Provider who has trained technicians available.Depot Service requires sending the unit to the Lenovo repair center. Repair time will vary based on parts availability but is typically 5-10 days to return the system to customer.Onsite service is next business day, 9AM to 5 PM and is based on when call is received by the Lenovo support agent. (Not available in Puerto Rico)Hardware warranty support for Notebook systems addresses major components as defined in the terms and conditions.Lenovo recommends Onsite service for higher level of service and more immediate assistance. A Lenovo certified technician will be dispatched to your place of business/residence in such cases where the problem cannot be solved over the phone.